This venue was added to our database on May 28, 2007, and the venue's information was last updated 11 years ago. angaym k oss is responsible for keeping this venue's information up to date. This page has been viewed 2341 time(s). 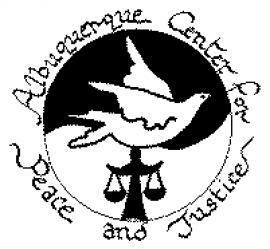 The Albuquerque Center for Peace and Justice is not necessarily a performance venue. They make great strides to serve this community in the area it's name implies. We appreciate that they are open to letting bands perform there for all ages shows. If you wish to contact the P&J center in regards to thier community endeavors (global community as well!) use the contacts provided here. If you wish to book a show, however, you must use specific contacts provided in "additional info" area. Realize that CENTER PERSONEL DO NO BOOKING, as they are quite busy with thier business at hand! Thank you. 2. ANY and all drugs or alcohol are not permitted anywhere on premises (this includes inside venue, outside parking lot, surrounding sidewalk and street areas). 3. You must donate an agreed upon percentage of the door money to the center itself. 4. There is no PA of any kind at the center. All bands are expected to provide thier own means of amplification. 5. Availability of the center, for performance, is quite limited. 6. Bands & promoters that do put on shows at the center assume all financial responsibility should any damage or theft occur to Abq P&J Center property. ***while all this may seem a bit tenacious or bothersome please remember that the very nature of what the Peace and Justice Center is and does can often be under heavy, unqualified, scrutiny from some powers that be. We must ensure to the center it's best interest on our behalf. Thank You! © copyright 1993-2007 by fearstudios.com ( 186215050+233ms ). All Rights Reserved. Report a bug or make a suggestion.